Ferretti Group is a world leader in design, construction and sale of luxury yachts and boats under six exclusive brands: Ferretti Yachts, Riva, Pershing, Itama, Mochi Craft, CRN and Custom Line. In their wide range offer, Ferretti combines the efficiency of industrial production with typical world-class Italian craftsmanship and innovation. Established in 1968, today the Ferretti Group has over 1500 employees and is present in over 80 countries. Together with the main production and seven offices in Italy, they also have offices and sales centers in Florida, Shanghai, and Hong Kong. In 2016 the Ferretti Group started to centralize their IT environment leveraging Microsoft’s RDS. “We were able to cut the costs and have a more standard environment for the end-users”, explains the IT Infrastructure, Security and Support Manager at Ferretti. But, “the standard Microsoft RDS solution also showed some weaknesses. For example, the configuration of the client on the end-user device brought challenges for mobile users such as sales”. Today, the Ferretti Group uses a mix of devices such as Apple iPad’s and Microsoft Windows-based laptops or desktops. To hook-up mobile workers into the central IT platform, Ferretti decided to implement Awingu. “We deployed Awingu on our hyper-converged Nutanix infrastructure in less than one hour. It is a very straight-forward solution”, says the IT manager. 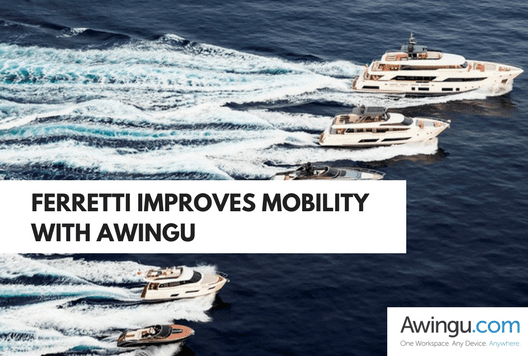 For an international company like Ferretti, mobility is crucial and by enabling simplified access to apps and files, their productivity and sales activity got easier and faster. “Our sales guys can access apps easily without any need for installing or managing any local client,” concludes the company’s IT and security manager.